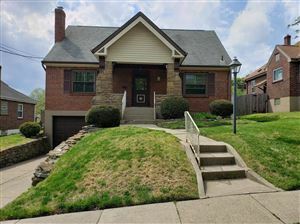 Oakley is a young professional neighborhood in Cincinnati, Ohio that borders Pleasant Ridge, Madisonville, and Hyde Park. Oakley's business district, called Oakley Square, lies along Madison Road. Oakley is a primary thoroughfare and a major crosstown artery in Cincinnati. In addition to Oakley Square, Oakley contains two shopping centers. Hyde Park Plaza on the south edge is named for the neighborhood to the south and is located at the intersection of two smaller neighborhood streets, Paxton Ave, which connects Oakley to Hyde Park and Mt Lookout, and Wasson Rd, which runs along the former Cincinnati and Eastern Railway line and connects Hyde Park Plaza to the larger Rookwood shopping centers in Norwood. The Center of Cincinnati on the north edge is part of continuing development on the south side of the I-71/Norwood Lateral/Ridge Rd interchange. Both of these centers are urban infill and car oriented, located on the edge of Oakley and designed to serve multiple neighborhoods. Oakley Square, by contrast, is located in the center of Oakley along several bus routes, making it more pedestrian and transit oriented.